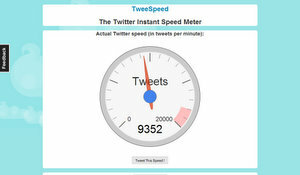 TweeSpeed is the tweets speedometer of the Twitter-sphere. How does it work? Well, it simply grabs the last 5 minutes of Twitter public timeline and calculates the average tweets per minute. The information is displayed in a gauge, and is updated every minute without the need to reload the page. TweeSpeed is the creation of TESIAL sprl, and you can follow the updates on Twitter @tweespeed. Now, we have a widget which allows you to display the Twitter Speed on your website.